Reusable packaging service provider Euro Pool System has set up shop in UK. “I’m looking forward to working with the UK retail market to develop solutions that meet their current and ongoing needs,” stated Steve Raybould, manager of the UK organisation. With several service centers and offices in the Netherlands, Germany, Belgium, Spain, France, Italy and the Czech Republic, UK is the eighth country where Euro Pool System has established itself. 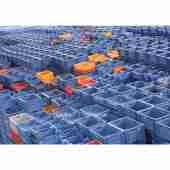 The reason for crossing over to Great Britain is that British retailers are receiving an ever increasing amount of fresh produce from the continent in Euro Pool System’s returnable containers.